There goes a popular saying in Odia - "Baara maasa re tera parba" (13 festivals in 12 months of a year), literally meaning that Odisha remains in a festive mood all throughout the year with a string of festivals dotting the Odia calendar over the year with at least one major ceremony or festival celebrated each month. 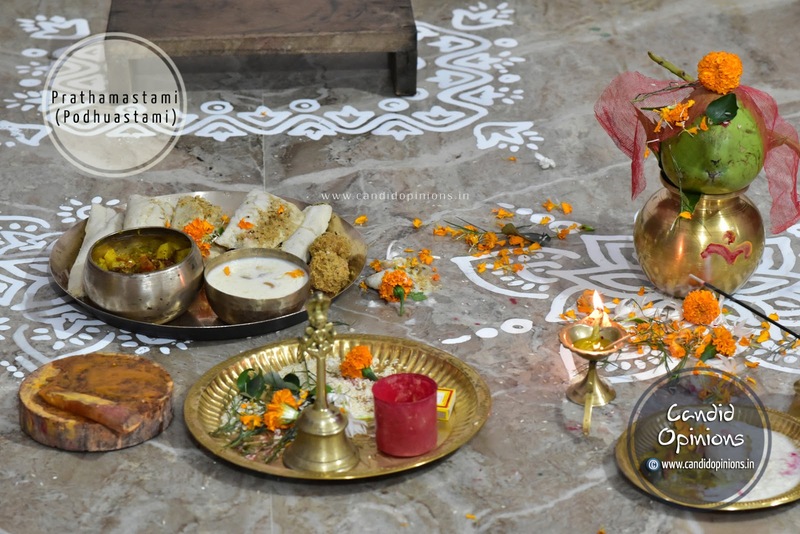 Today is Prathamastami - another popular ceremony among the Odias - that is observed on the eighth day of the month of Margasira (usually falls in November or December) in which the mother or a female elder of the family prays to Goddess Sathi for the well-being and prosperity of the first-born or the eldest child ("Podhuan"). 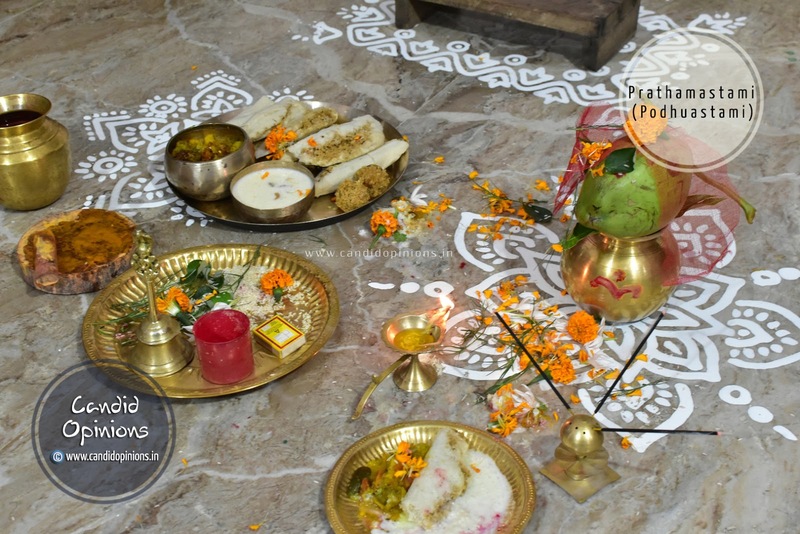 As per the tradition, on this day, the eldest child of the family is asked to sit on a wooden pedestal (pidha) and before him/her is placed a kalash (earthen pot filled with water) over a handful of paddy and a five-petalled or a seven-petalled mango leaf over which a coconut is placed. The child is then given a lighted lamp ovation, new clothes, and blessings from the elders. These gifts (new clothes, new rice and new urad dal) are given by the maternal uncle (mamu). 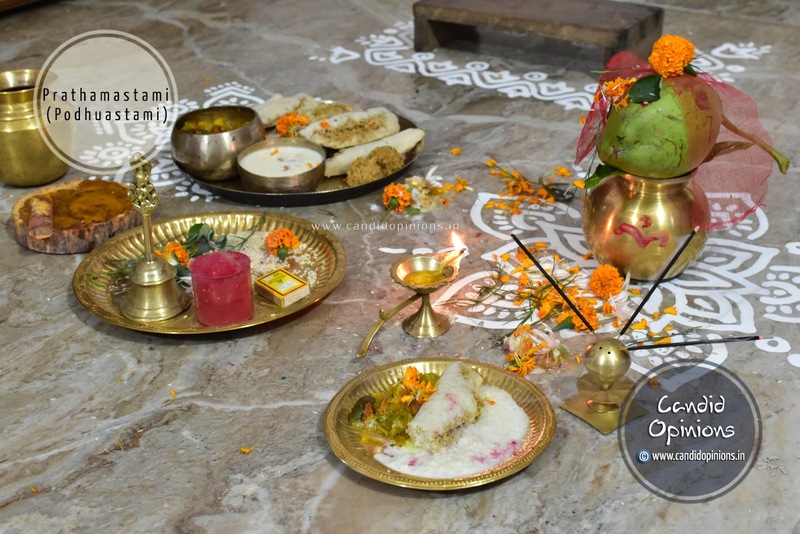 As if it's a norm, almost each of the major Odia festivals is associated with a particular pitha and so is Prathamastami - the special attraction of the festival being the "Enduri Pitha". 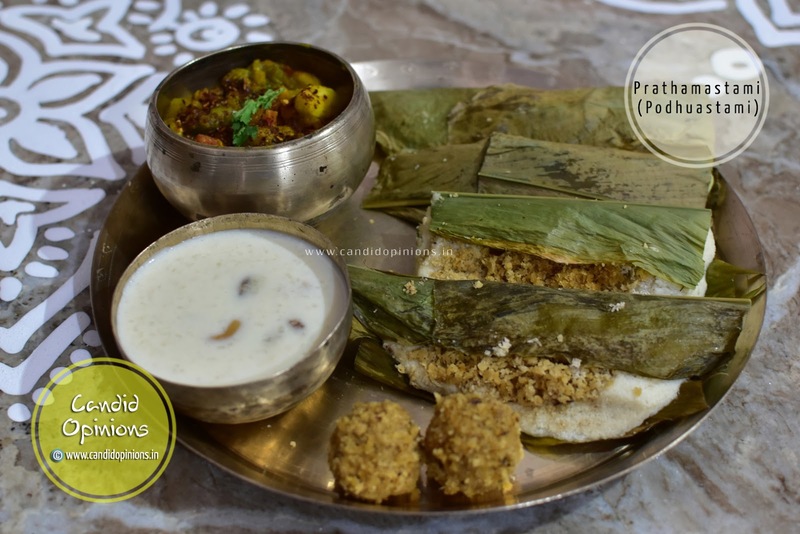 Although the preparation method of Enduri Pitha might look similar to that of Idlis, however it is distinctly different in that the "enduri pithas" are elongated in shape, have a sweetened stuffing - that of grated coconut mixed with palm jaggery (deep brownish in colour) and are wrapped in turmeric leaves before being steamed. So the Enduri Pithas have a distinct but subtle smell and taste of turmeric. 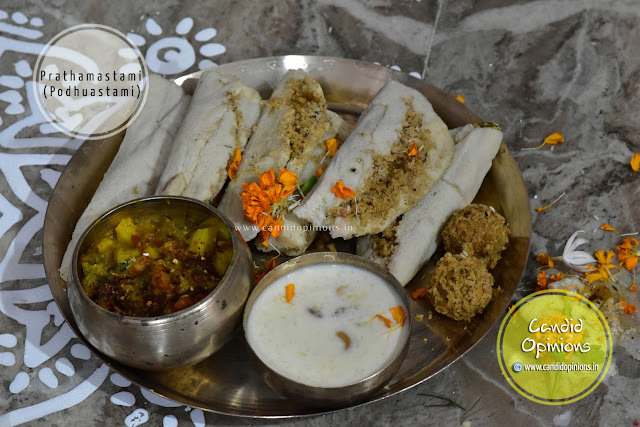 To prepare Enduri Pitha, a fine but fairly thick batter of black gram dal and rice is prepared, which is then spread over a turmeric leaf. 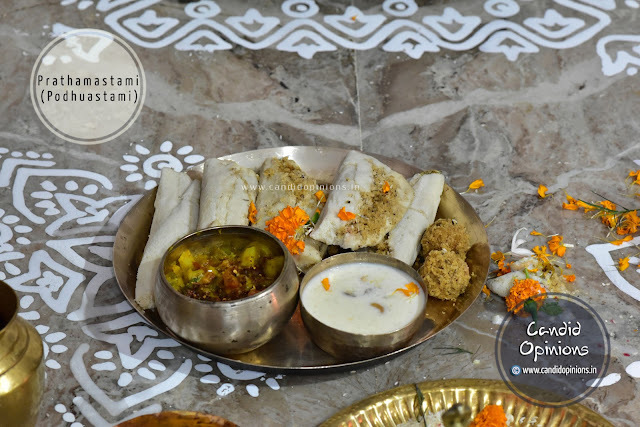 The stuffing, prepared from a mixture of freshly grated coconut, palm jaggery, crushed black peppercorns, edible camphor and crushed green cardamoms, is spread evenly in the centre and then the turmeric leaf is folded so that the stuffing gets sandwiched in the centre. 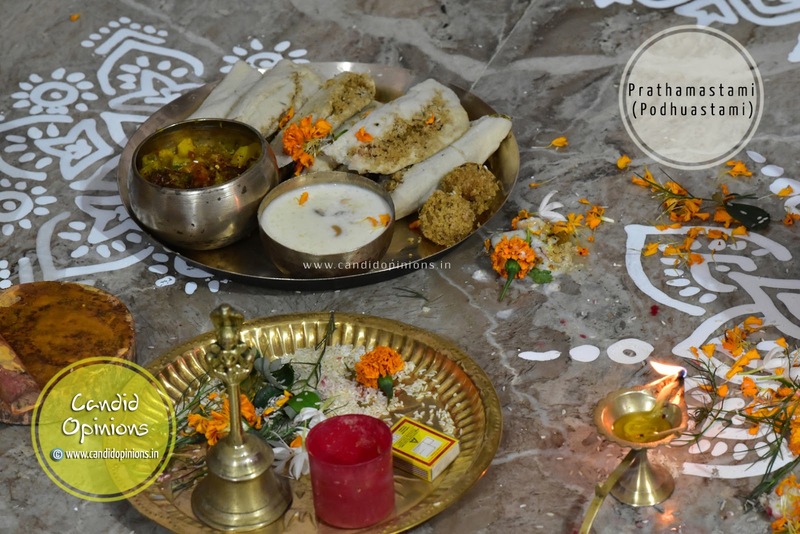 It is then steamed in the steaming pot much like the idlis, however the major difference is that while preparing Enduri Pithas, "athaara" is used (a clean soft muslin cloth is tied over the mouth of the steaming pot but before that turmeric leaves are dropped into the steaming pot, thus imparting a subtle smell and taste of turmeric to the pithas. While eating, the wraps of turmeric leaves are removed from the pithas but their goodness and medicinal value get passed onto the pithas. Thus the enduri pithas have a unique aroma of turmeric leaves, in addition to their health benefits especially in the winter season. 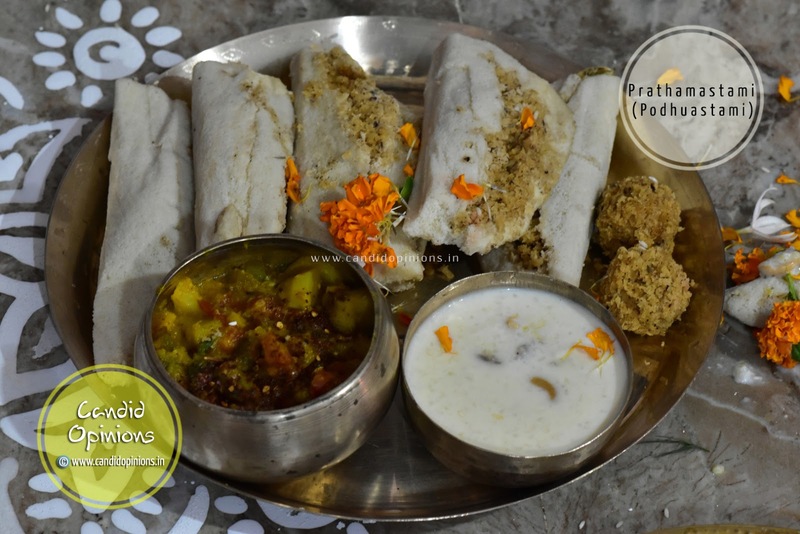 Thus besides tickling one's taste buds, enduri pithas also help in strengthening his/her immune system.